Prerna Sodhi is an Indian journalist working with the New Delhi-based Development Alternatives, a sustainable development NGO which aims to deliver socially equitable, environmentally sound and economically scalable development outcomes. NEW DELHI, May 16 2015 (IPS) - “Swachh Bharat”, or Clean India, is a slogan that most Indians today associate with the country’s Prime Minister Narendra Modi and his first nation-wide campaign launched soon after taking office in 2014. The call has definitely awakened popular consciousness on cleanliness but whether citizens follow it or not is another matter. In fact, it is commonplace to find people calling out “Swachh Bharat” as they toss garbage onto the street. However, while the campaign may not have brought about the change it was aimed to usher in, a dialogue has started and it is a watershed moment for all those working in this area to capitalise on its momentum. The idea of cleaning India up is not new, and neither is the term “Swachh Bharat” which has been used by many in the past and has now been “patented” by Modi. For decades, there has been concern with instilling an awareness of the need for cleanliness among citizens, many of whom even defecate in the open. The current initiative by the government may address the issue of cleanliness at citizens’ level, but activists in the field of sustainable development argue that it should also cover issues related to water, energy and sewage disposal cleanliness. Access to clean water is one of the main problems that the country faces. According to a report by UNICEF (the U.N. Children’s Agency) and the Food and Agriculture Organisation (FAO), every year around 37.7 million Indians are affected by waterborne diseases, 1.5 million children die of diarrhoea alone and 73 million working days are lost due to waterborne diseases. The problem does not appear to lie in the lack of availability of water treatment methods, but rather in the unwillingness of people to adopt these methods. 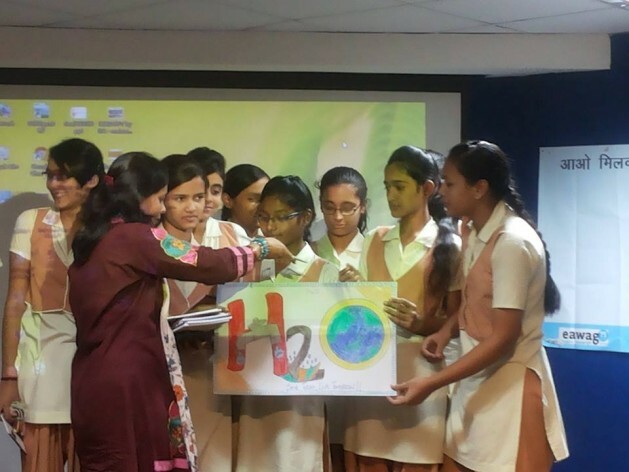 “From the field, we observed that the lack of adoption of water purification techniques is not due to low awareness levels and it was not even illiteracy, as is often assumed,” said Kavneet Kaur, field manager for Development Alternatives (DA), a social enterprise set up in 1982 to tackle the serious impact of climate change on society and the environment. “There was an evident lack of effort and prioritisation of safety among people to undertake one or more options consistently that made drinking water safe,” she added. For the last 30 years, DA, which works primarily in Bundelkhand in central India, has been addressing the behaviour change necessary for people to adopt water treatment methods. To date, DA has reached out to 50,000 households and 26 schools through intensive advocacy campaigns in urban villages, offering training on how to adopt safe water treatment methods such as SODIS, boiling, chlorination and sieving, despite meeting strong resistance from the local population. For example, storing water in a PET (polyethylene terephthalate) bottle exposed to sunlight can kill up to 99 percent of the bacteria in the water, an “innovation” that uses nothing but natural ultraviolet (UV) light to provide safe drinking water for consumption. Water can also be purified by sieving boiled water. Apart from advocating the adoption of these simple water purification methods, DA has also come up with innovations like the Jal-TARA Water Filter, which removes arsenic, pathogenic bacteria and excess iron from contaminated water, TARA Aqua+ (a sodium hypochlorite solution for purifying water), and TARA Aquacheck Vial, a device that tests for the presence of pathogenic bacteria. Nevertheless, these innovations are not destined to go very far unless there is a major change in the mindset of the Indian people, and this extends to the “Swachh Bharat” campaign, not just in terms of clean water but also of a cleaner environment. This idea has also been the driving force behind a youth-led social media campaign known as CLEAN-India ‘The City I Want’, launched by SA and now covering ten Indian cities – Mirzapur, Mohali, Vadodara, Alwar, Ambala, Bharatpur, Indore, Nashik, Mussoorie and Rishikesh. CLEAN-India (where CLEAN stands for Community Led Environment Action Network) is an environmental assessment, awareness, action and advocacy programme that promotes behavioural change among young city dwellers. It has so far mobilised 28 NGOs, 300 schools, 800 teachers and over one million students. The campaign is flanked by a number of other citizens’ groups such as resident welfare associations, parent forums, local business associations and clubs, which are actively participating in activities for environmental improvement. “Going forward, it is crucial that civil society organisation practitioners interface with academic institutions in evidence gathering and inform policy-makers and investors in order to create enabling conditions where scalable innovation can flourish,” says Lakshmi.